This binocular is designed to be mounted to a tripod with camera/video head capable of handling 8.5 lbs. If you ordered the binocular with a tripod, it will have the tripod head’s quick-release plate pre-installed. Back the quick-release plate into the head as shown below. Use the thumbscrew on the left side of the head to lock the quick-release plate in position. 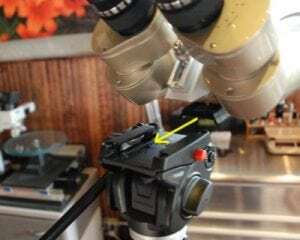 To remove, loosen the thumbscrew, slide the binocular and quick-release plate forward. The plate will stop when it hits the safety lock- twist the small knob on the right side to allow the quick-release plate to disengage from the head. 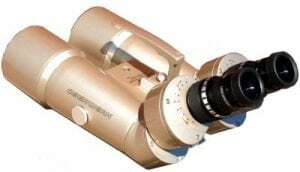 When inserting eyepieces into the focusers, first loosen (turn counter-clockwise) the eyepiece lock ring (the shiny knurled ring at the top of the focuser). 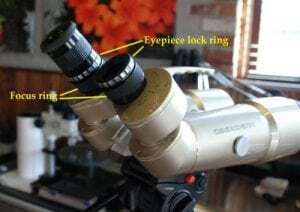 Once the eyepiece is inserted, tighten the ring (clockwise, with not much force) to prevent the eyepiece from falling out. When viewing through the binocular for the first time, set the IPD (inter-pupillary distance) to match your eye spacing by twisting the prism housings (the tuna-can shaped parts directly below the focusers) together or apart, until you get a well-merged image with both eyes. Focus one eye at a time by turning the large knurled focus rings in between the prism housings and the eyepieces. While most windows do not degrade image quality, some do. If image quality is not good, move the binocular to another window. Avoid windows with screens. If not sure if window is degrading image quality, point binocular toward an open exterior door, or move outdoors, to see if image quality improves. NOTE: This binocular is not weatherproof, do not leave it outdoors if there is any chance of rain, unless you are using our weatherproof cover.